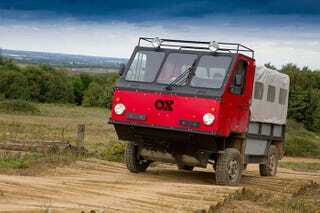 Legendary F1 design wizard Gordon Murray and saintly British philanthropist Sir Torquil Norman have teamed up to build the GVT OX, a revolutionary, low-cost, flat-pack truck to aid the developing world. It’s rugged, simple to maintain and repair, and can be assembled by three trained people in just twelve hours. It can traverse rough and rutted dirt roads with ease and can transport thirteen people. And if it gets funded and built en masse, it could drastically improve life and work for people living in rural areas of developing nations. But we’ll let those goody two-shoes (two shoeses?) worry about the underprivileged. The OX would be great for us selfish, pompous first-worlders, too! Here’s why. It satisfies our DIY, Lego-happy culture. Oh man, do we love to build things without needing to be technicians. Everyone wants to make something, but no one wants to map it out in Solidworks and 3D-print the parts. That’s why we pay exorbitant prices for Lego kits. It makes us feel like experts. The OX is a perfect way to scratch that itch. Other than a little welding, the truck bolts and rivets together out of the box, so you can tell people you built it in a weekend. The OX team says this is to help provide jobs for locals and cut down on shipping costs, which it surely would, but it also lets you build one in your garage! And don’t worry about legality. The OX is the ultimate definition of a kit car, since you build it yourself, and most states allow kit car registration, as long as yours has the proper lights, which the OX includes. It’s flat-packed for supreme IKEA trendiness. those heavy boxes your neighbor brought home from the Meatball Store. It’s basically a McLaren F1. The OX’s cabin seats three people, with the driver in the center. The McLaren F1 supercar seats three people, with the driver in the center. Both were designed by Gordon Murray. The OX people say this makes the truck equally legal and accessible in countries with left hand drive and right hand drive, and that it improves visibility and cuts down on parts and complexity. But we know what you’re up to, Murray. You’re trying to bring back the F1, and we’re happy to help. You can spearhead the FWD off-roading movement. Murray had the brilliant idea of making the OX front-wheel-drive. This vastly cuts down on weight and complexity, and allows each wheel to move independently with ease, improving ground clearance. The cab-over design puts more than 70% of the truck’s unladen weight over the front wheels, and when carrying a full load, the clever trailing arm suspension setup puts the weight at an even 50/50. Each wheel sticks to the ground independently, and the OX has been tested to work just as well in muddy and rocky conditions as its 4WD counterparts. It can also wade safely through a meter of water, which sounds like a great way to cool off. This will all be lovely for the people in sub-Saharan Africa, but what about you in suburban America? You could start a new trend. All those expensive Jeeps with their center diffs and their fancy-pants drive shafts? You could show them up at Moab with your OX, all in front-wheel-drive. And let’s not forget the most important aspect of off-roading: accessorizing. The OX has an optional roof rack with plenty of space to rig up some lights, and I’m sure a winch isn’t out of the question, either. Heck, how long will it be before someone builds an e-diff kit for the rear wheels, with a simple electric motor to power them as needed? It should be easy to modify. Murray and co. designed the OX to fit a ubiquitous Ford 2.2 liter diesel engine and a cable-clutched 5-speed. Well, ubiquitous everywhere but America, but that’s beside the point. It offers 100 hp and 283 lb-ft of torque, which should be plenty to move the truck’s relatively light 3,500 lb weight at a decent pace. But you know what else is great about diesels? They’re easy to tune for more power. Plus, the team hopes to one day have electric or hydrogen-powered OXes (OXen? ), so engine swaps should be easy. If you leave the diesel in, it’s the perfect way to test your doomsday prepper veggie oil system. It’s the ultimate camper base. You can use it to ease the guilt your closed and selfish world has fostered, all while having fun. Who wants to go to the developing world and build charity houses when you can go and build charity trucks? It’s therapeutic, right? Imagine flying to Africa, using your mechanical skills to train some locals to weld and rivet for a week, then flying home. You can clear that polluted well you call a conscience for at least a month or two. Or picture this: Arrive at a shipping hub in Africa, buy an OX, build it, and race against other teams to deliver it to a village. Your social media followers will be so impressed! And building anything this simple and straightforward will be relaxing and fun. Over-the-counter off-roaders have become so horrifically complex. Extensively modifying one seems to take an engineering degree. But something made of square tubing and composites, with a simple, FWD power unit? So refreshing. GTV is currently looking for financial backers to start mass production, so if you know any billionaire gearheads who want to help millions of people in the developing world you look cool romping around in a field, share away.